This post has been sponsored by Enterprise CarShare. There’s a McDonalds at the edge of the Gettysburg battlefield, visible from the high water mark of the Confederacy, where Pickett’s charge crashed against Union troops on Cemetery Ridge. The rebels got this far but none further, their invasion of the North coming to an end. And, past the green fields, golden arches, a reminder that this momentous battle took place on some very familiar territory. It didn’t happen in history books, it happened across a Mid-Atlantic landscape of farms and towns that General Lee would recognize today. The battlefield sprawls over a vast territory – hills, forests, corn fields, peach orchards – and is cut into pie slices by roads that converge upon the town of Gettysburg. Turnpikes drew the Confederates from the west and Federals from the east, pulled into a three-day slug fest of cannon and rifle. 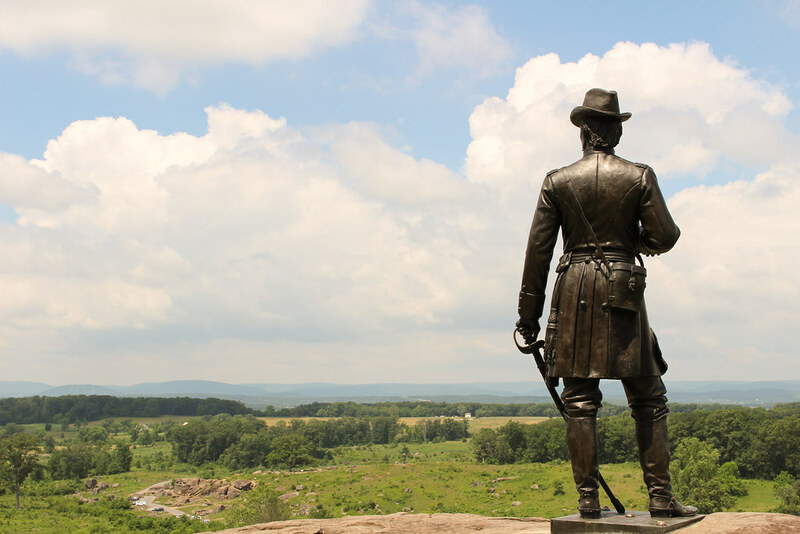 It’s fitting that a road tour is the best way to experience Gettysburg. After visiting a very modern museum that puts the battle in its Civil War context, the auto tour takes you to the action, leading you in chronological order around the battlefield, from the first skirmishes on the edge of town to the bloody struggles for the high ground. The way is dotted with historic landmarks erected by the states to honor their sacred dead. Being there gives you a three-dimensional perspective to the battle. Standing on Little Round Top, you can see, as Brigadier General Gouverneur Kemble Warren did, that this was the key spot that dominated that battlefield, a steep and virtually unassailable hill on the Union left flank. His prompt action in fortifying the hill saved the Union army from defeat. It is for us the living, rather, to be dedicated here to the unfinished work which they who fought here have thus far so nobly advanced. Teenagers. Useless, am I right? Unless you’re a 17-year-old George Washington who surveyed a town in the Blue Ridge foothills, a town that would eventually be named after him. It’s Washington, VA, commonly known as Little Washington to differentiate it from nearby Washington, DC. Set amid vineyards and rolling green hills, it’s a quaint village that’s home to the five-star Inn at Little Washington. 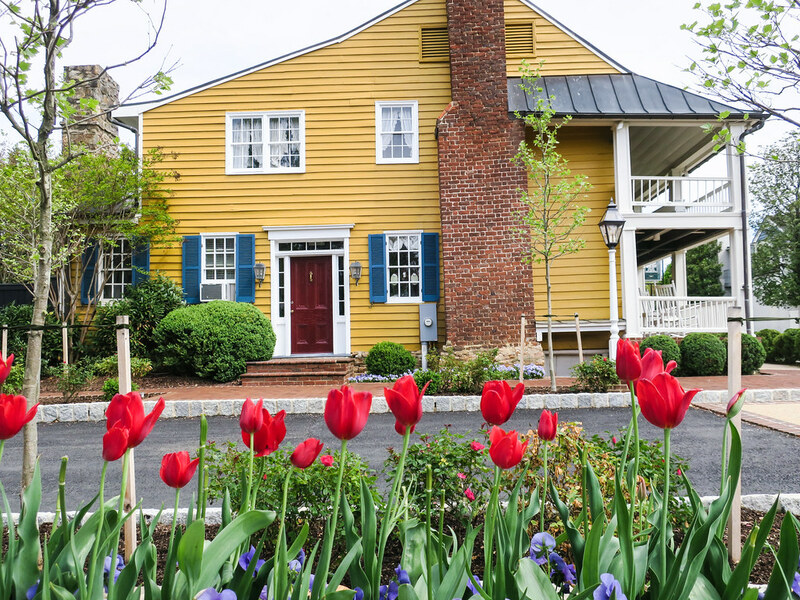 The inn itself is several buildings on both sides of the street that date back to the arrival of George Washington in 1749. Behind the inn, there’s a short walking path that circles a field full of photogenic farm animals, from goats to a pair of llamas. The village’s neat grid was laid out by the Founding Father himself. Little Washington is a historic landmark that has been carefully preserved, enabling you to imagine yourself in the George Washington’s day. One of the attractions of this DC day trip is the drive from the city. After you escape I-66, the scenery grows hillier and greener as advance toward the mountains until you end up on a gentle two-lane road coasting into a town bursting with tulips. Located just 70 miles from Washington, DC, this other Washington – Little Washington – is a quiet respite from the busy city. Check out the photos from this nice day trip, taken with my rocking little Canon G9 X. Love this little camera. Island life makes people a little crazy. Key West has the Conch Republic and a little neighborhood in Annapolis has the Maritime Republic of Eastport? While technically not an island, Eastport feels that way, located across a drawbridge from highfalutin historic Annapolis, MD. But you won’t find cobblestone streets and signers of the Declaration of Independence here. With its narrow lanes, wooden shacks and air redolent of the Chesapeake Bay, it really did remind me a bit of Key West. 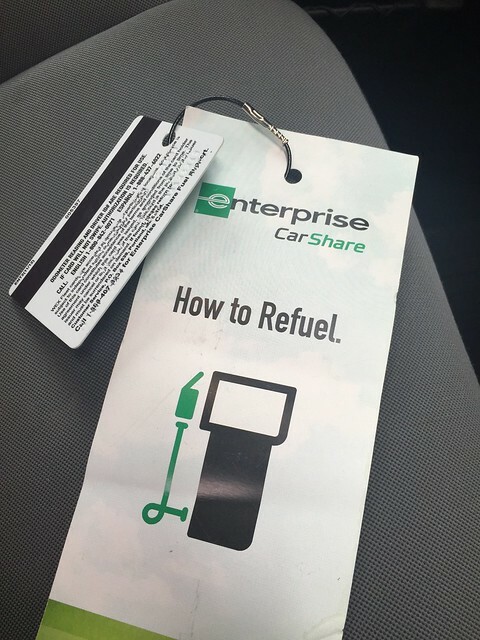 My trip to Eastport was courtesy of Enterprise CarShare. I’m a social media ambassador for them, like a real millennial. It was a day trip for me. Easy – you reserve a car online, swipe a card over a sensor on the windshield and drive off. Gas is even included. Ford Escape – an SUV that I actually like. I picked a Ford Escape which was conveniently parked a block from me. I really like that little SUV. 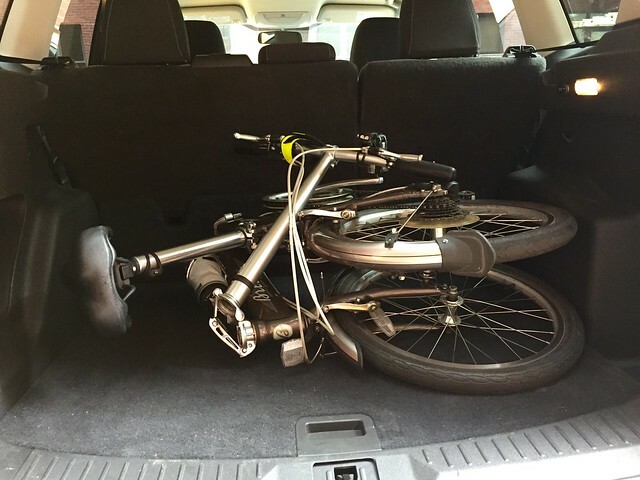 You can haul stuff with it (like a bike) but it’s also nimble enough to parallel park. 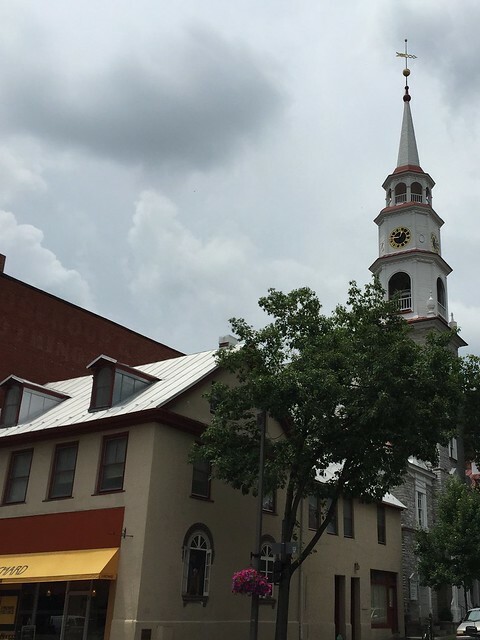 Annapolis is about an hour from DC. Once there, I stopped for coffee at Ceremony. Coffee and a muffin at Ceremony Coffee in Annapolis. Then I met my friends Lynn and Anthony for lunch at Davis’ Pub in Eastport. Crab dip over a pretzel – delicious! It was also nice to sit outside by the water at this unpretentious bar. Lynn and Anthony has said that no one has ever not liked this crab dip – they were right! We then walked over to the Annapolis Maritime Museum. This riverfront museum is devoted to the history, ecology and the arts of the Chesapeake Bay. Learned a bunch about oysters. And they had a great exhibit of photos on the people still wresting a living from the bay. Photo exhibit at the Annapolis Maritime Museum. This was the third of my three free trips courtesy of Enterprise. I get free travel and a small fee, and they get photos to use online. It’s been a great opportunity to explore new places and take photos. When I briefly owned a car in DC, all I did was worry about tickets, break-ins and having my car towed to some distant lot. Carsharing is easier, even for a non-millennial like me. 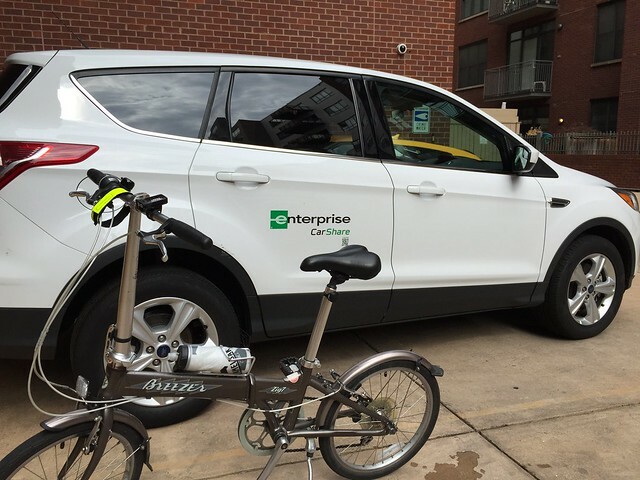 I’m kinda old to be a social media hipster but I was recently selected to be part of Enterprise Carshare’s #CarShareDC crew. Guess they liked my Instagram shots of beer and bikes. As a member of the crew, I get to take three free day trips this summer courtesy of Enterprise. Anywhere within 100 miles of DC is within my domain. In return, I have to take photos and share them on social media. I’d do this all on the iPhone, of course. 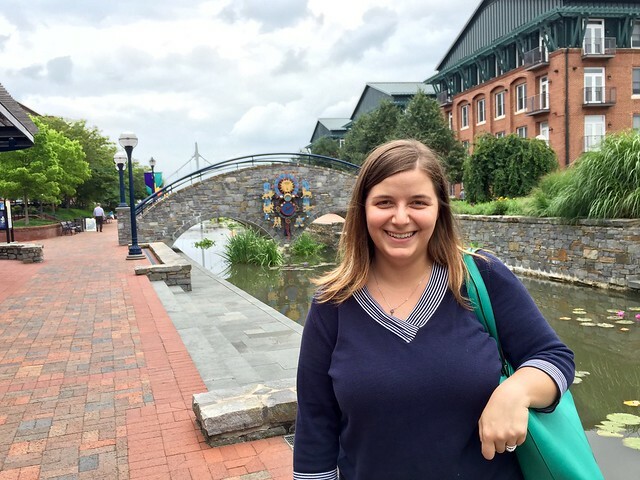 For my first auto excursion, I went to beautiful downtown Frederick to have lunch with my talented photographer friend Mary-Kate McKenna. Enterprise has cars around the city. I chose a Ford Escape, which was parked in an an alley about a block from where I live. It handled DC’s potholes with aplomb and was surprisingly maneuverable. Accompanying me, as always, was the foldy bike. Plenty of room for my foldy! Next time, I’ll have to bring my real bike. Gas is included but you may have to fill up the tank yourself. A gas card is in the glove compartment. Downtown Frederick. It’s about an hour from DC. Leaving after rush hour, I didn’t run into any traffic. Miss seeing this girl! I worked with MK at NOAA before she went away to bigger and better things. 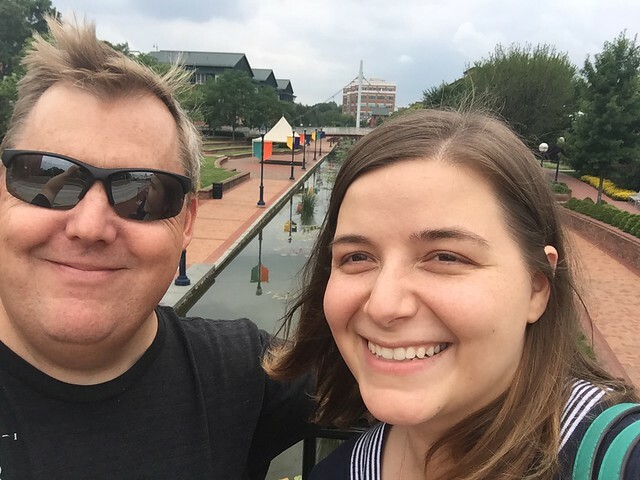 MK at Carrol Creek in Frederick. 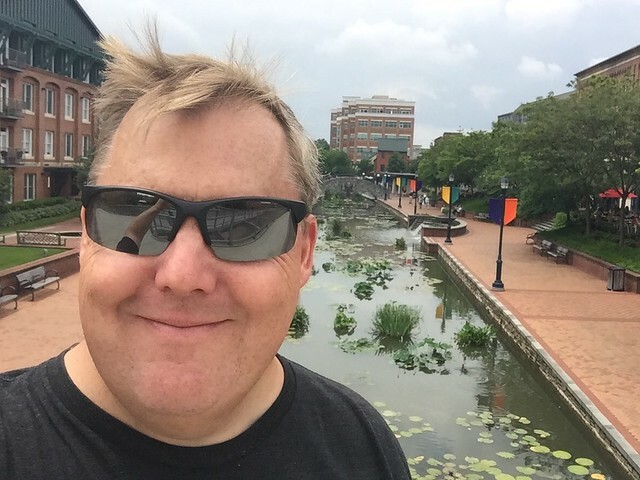 I’m selfieing along Carrol Creek, which is a linear park which runs through downtown Frederick. 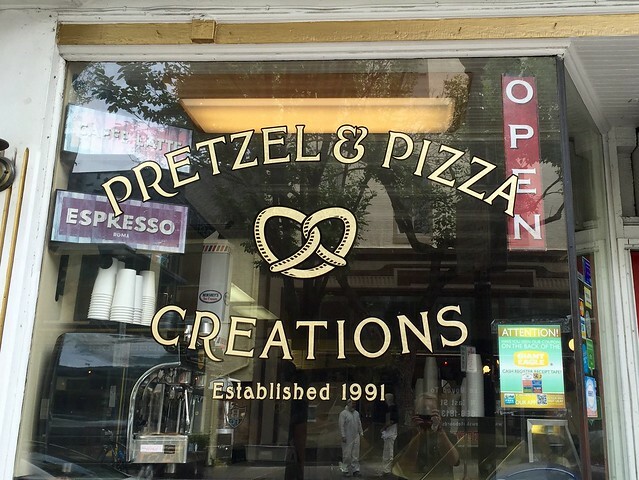 Lunch was at Pretzel & Pizza. 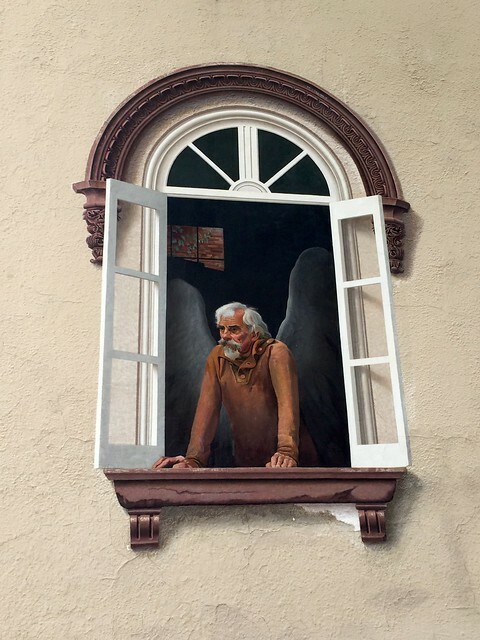 Earthbound, part of Angels in the Architecture by William Cochran. Frederick has a lot of art like this downtown. 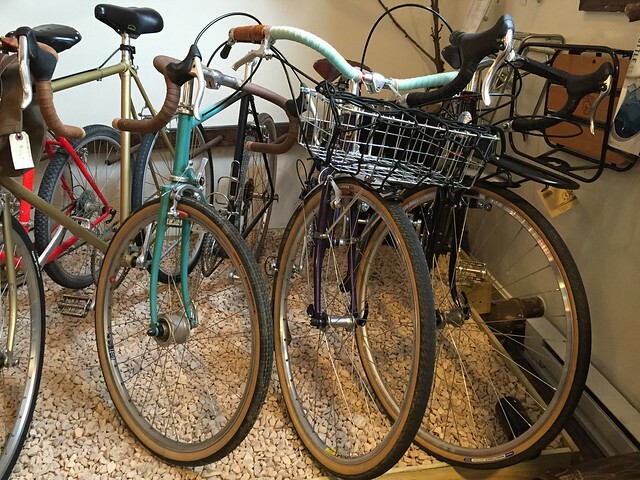 Vintage bikes! Coffee! 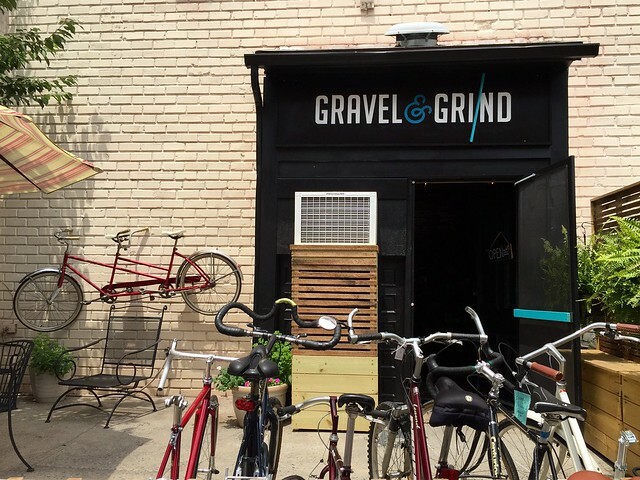 All my dreams in one store: Gravel & Grind. 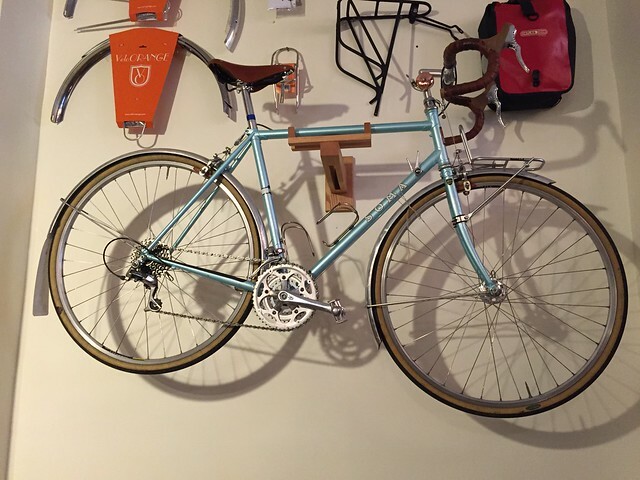 Vintage bikes which have been fixed-up and modified. A thing of beauty. Love that rack on the front. 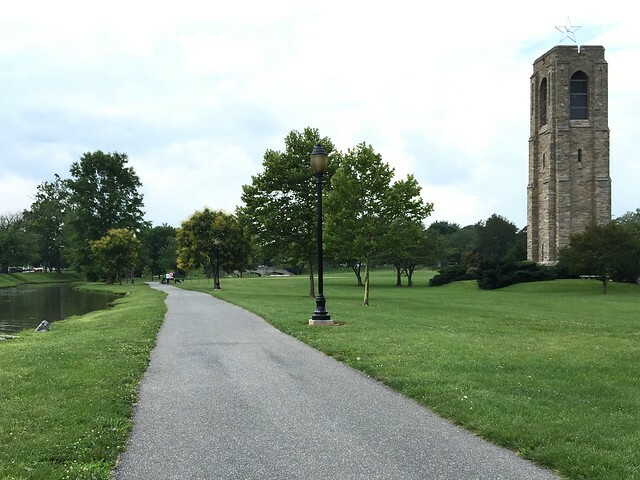 After coffee, I took my foldy bike for a little spin around Baker Park. When you’re all done, you return the car to its reserved parking space. 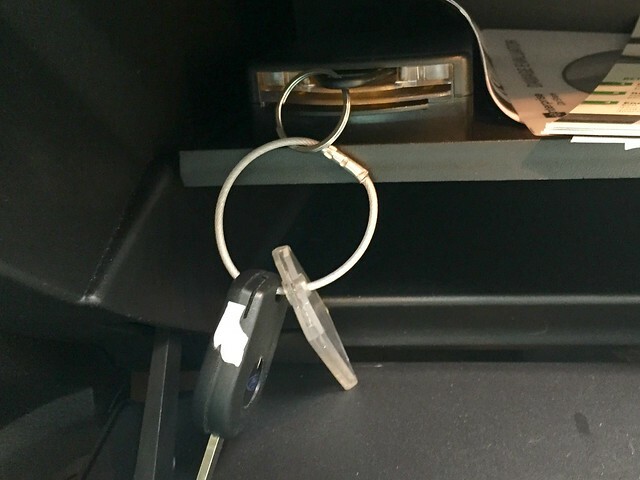 To end your trip, you put the keys in the glove compartment holder and swipe your Enterprise card on the windshield sensor. Trip #1 was a success! 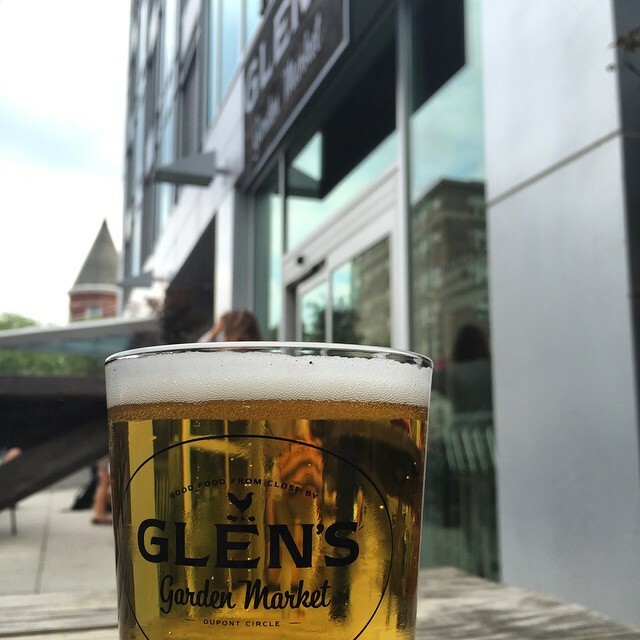 After I put the car away, I went to Glen’s for a $4 beer. Look for more adventures in carsharing coming this summer! 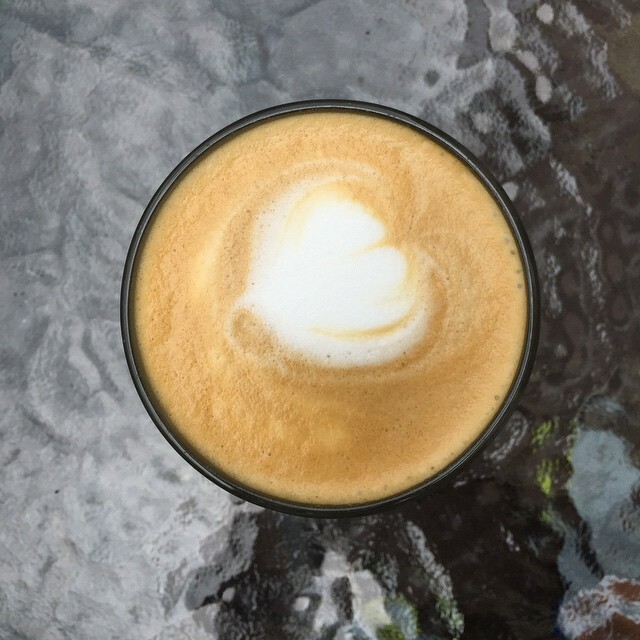 Author Joe FloodPosted on June 30, 2015 June 30, 2015 Categories reviewsTags bikedc, biking, careshareDC, coffee, enterprise, frederick, iphoneographyLeave a comment on Art, Coffee, Bikes… Frederick?